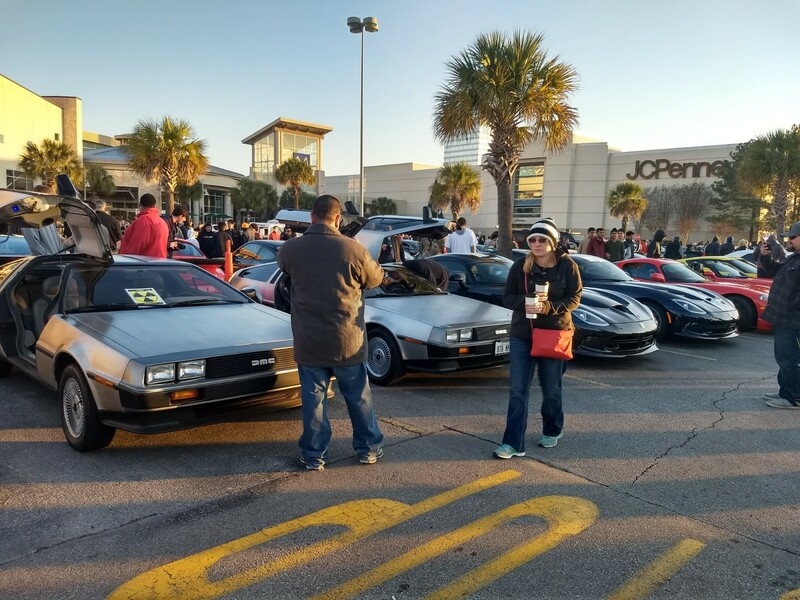 Saturday, January 6th, 8-10 AM, the first club activity was at the 1st 2018 Houston Coffee and Cars event. This is a HUGE street-meet (not really a car show). It was esitmated that somewhere between 700-800 show cars were there. Dennis Urech and Thomas Kidd attended in the very brisk, early moring meet, coffee in hand. Yes it was a bit cold, but a crystal-clear day in Houston. 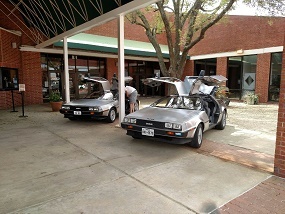 As usual, the DeLoreans showed well and were VERY popular. All the usual comments were heard; "I've never seen more than one a time." 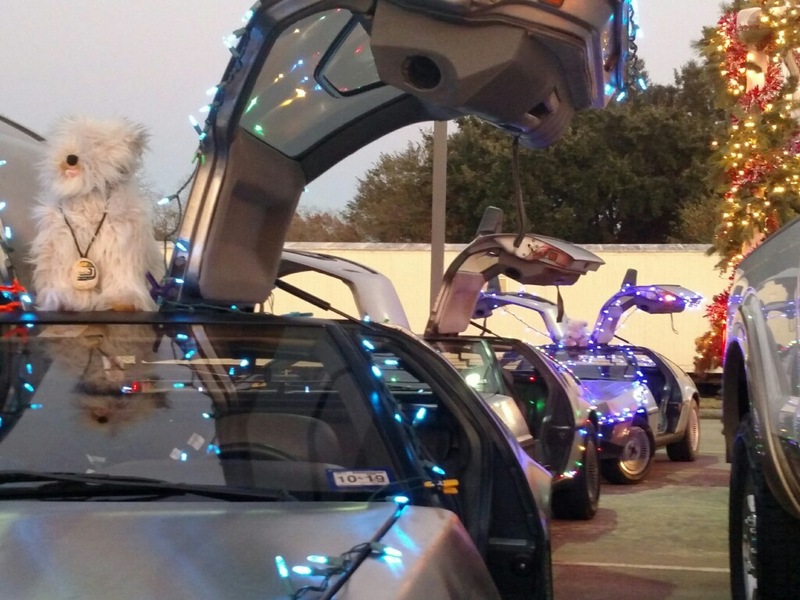 "That's the Back-to-the-Future car." 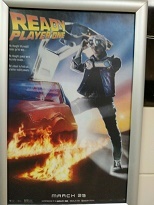 "Cool!" Etc. Photos by Thomas Kidd (click images to enlarge). 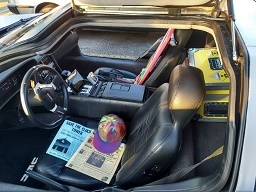 Thomas' car left, and Dennis' car right. 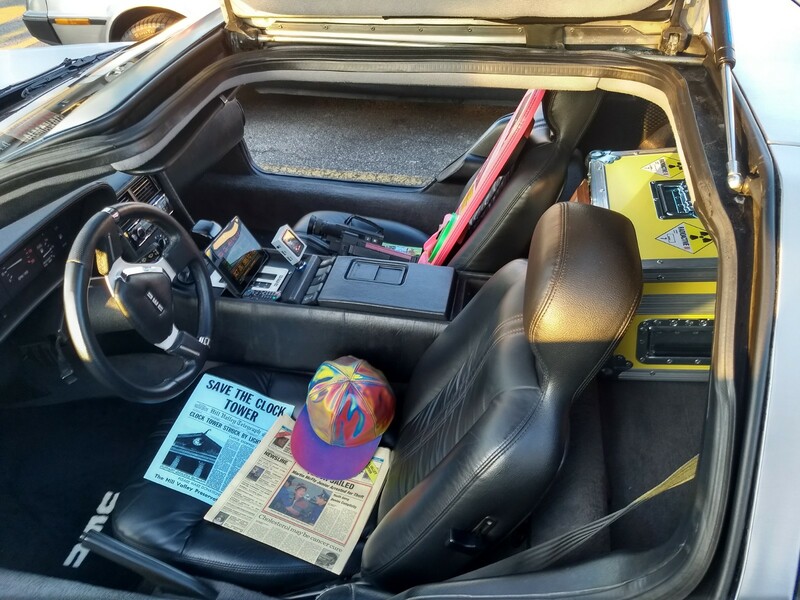 Dennis' car, with many BTTF props, including a Save the Clock Tower flyer, video tape recorder, hover board, plutonium box, mini-flux capacitor, Marty's hat and BTTF music playing the entire time. Nice touch! 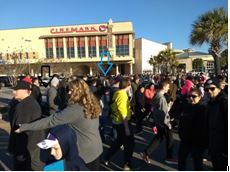 No, this meet was not at Twin Pines mall in southern California outside of JCPenny's, but here in our own Houston Texas. 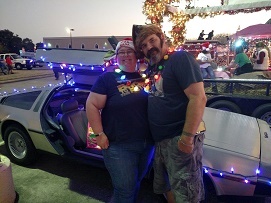 And we didn't see a VW bus full of Lybians with machine guns wanting their stuff back, although we did see a VW Vanagon full of kids and a dog hunting a place to park! Did I mention that there a LOT of spectators there? I mean A LOT! Literally thousands. In this picture you sort of get the idea. 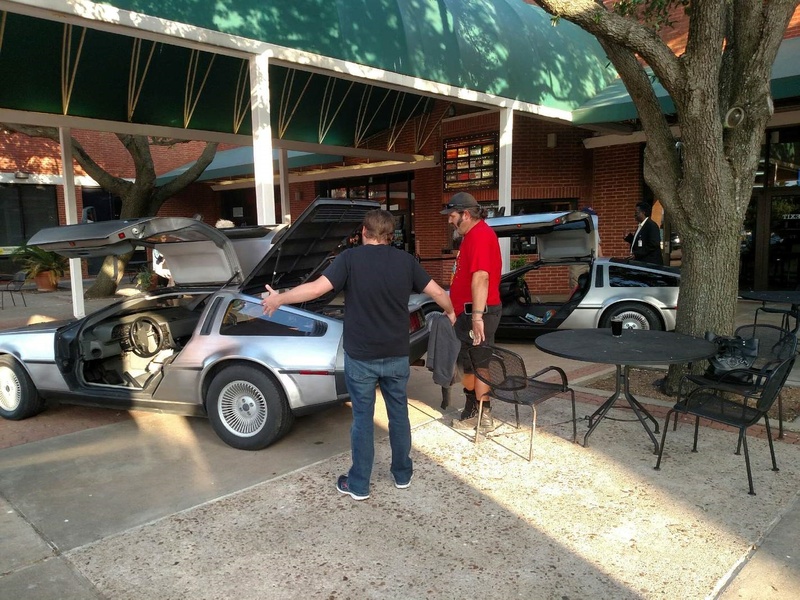 I've added arrows to help you find the two DeLoreans getting LOTS of attention. 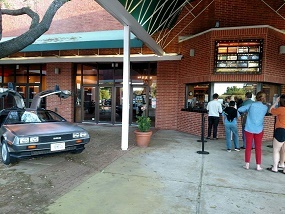 Sunday, March 25th, Alamo Draft House at Mason Park sponsored a Back To The Future Marathon at their Mason Road location. Sunday's are rare for DeLorean events around here, but events came together and it happened, starting at noon. Club members provided rotating static displays of DeLoreans throughout the day, as individual schedules permitted. Thanks to everyone who attended. Photos by Kimberly Terrell and Shannon Birdwell (click images to enlarge). DeLoreans on display. 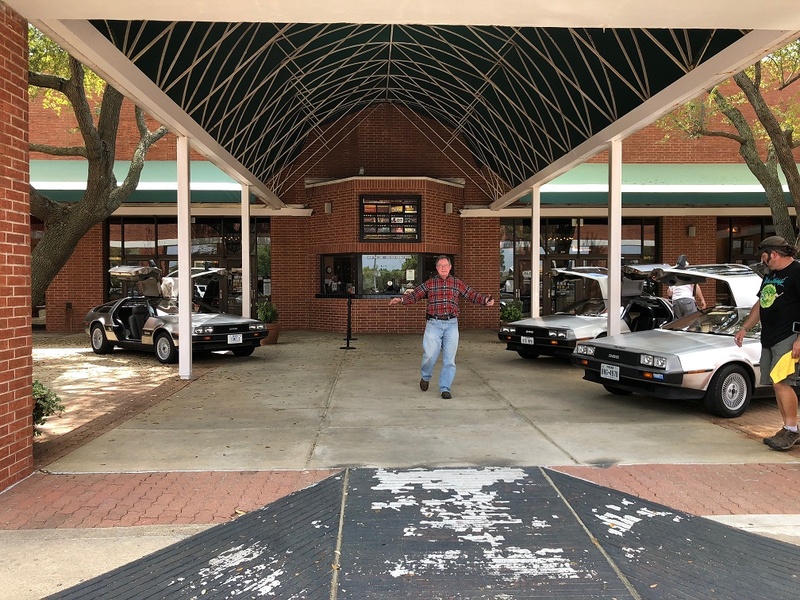 Welcome to my world [of DeLoreans]. Shannon's car left, Dennis' car right (far) and Kimberly's car right (near). Wednesday, March 28th, Alamo Draft House at Mason Park pre-screened one of the first showings of Ready Player One, and again invited the club to participate, because of it being DeLorean related. Photos by Shannon Birdwell (click images to enlarge). 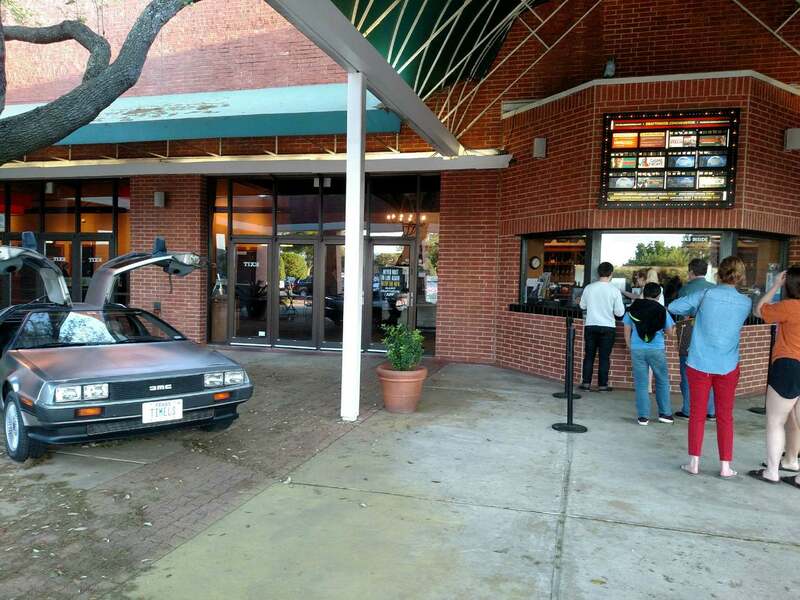 This was apparently the first screening of Ready Player One in the Houston Area, one day prior to the official film release. 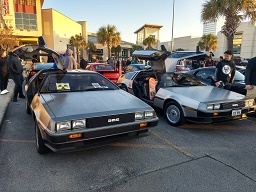 Of course all the people that paid good money to see the movie actually were coming not for the movie itself, but to see the most excellent part by the real star, the DeLorean. But then, I really didn't need to tell you that. Thursday, May 31st, the Alamo Draft House at Mason Park again screened Back To The Future. 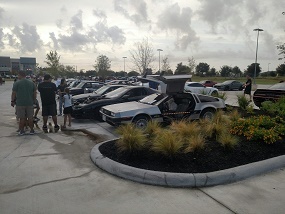 As usual, the DeLoreans showed well and were very popular. Photos by Shannon Birdwell and Kimberly Terrell (click images to enlarge). Three club cars attended; Shannon (back), Kimberly (left) and Dennis (right). "I'm not kidding you man, last week I caught a glimps of a DeLorean, and it was THIS big!" 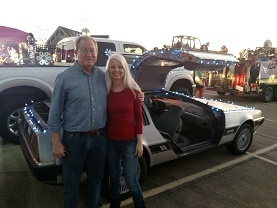 There's always a few hams that want to get their picture taken with a DeLorean. 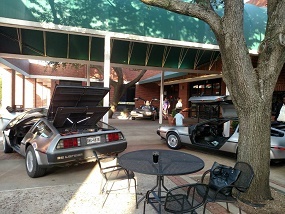 Even Doc Brown wanted a picture of another cool DeLorean. 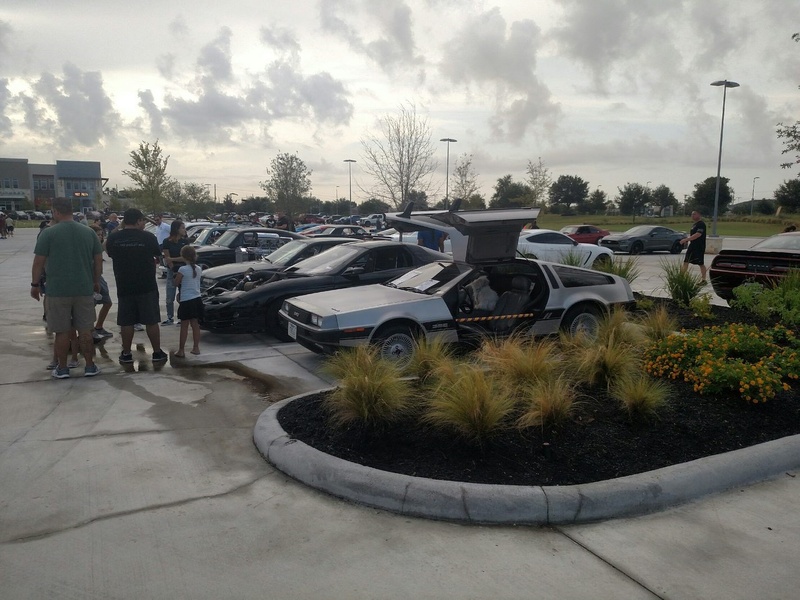 Although rain was predicted for Saturday, Shannon was able to make Coffee and Cars, this time at Towne Lake on Barker Cypress in NW Houston. 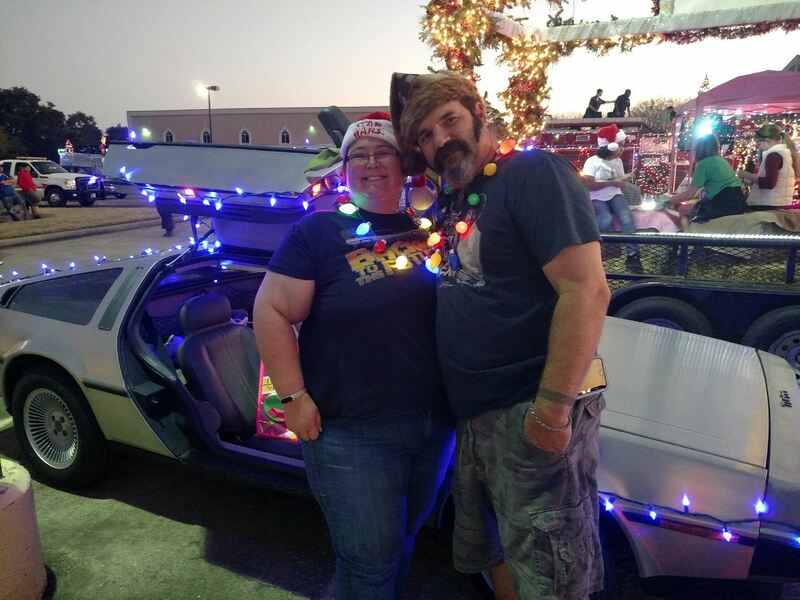 Photo by Shannon Birdwell (click image to enlarge). 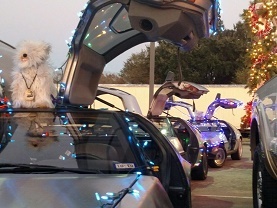 If you look closely, you can see Einsteine made another appearance inside the Timeless DeLorean. 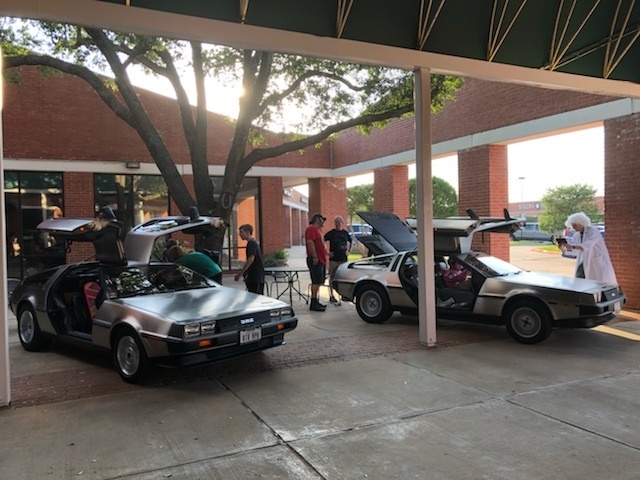 Saturday, September 8, Shannon was able to make another Coffee and Cars event (it's held close to his house, so he has fewer excuses than we do). Photo by Shannon Birdwell. 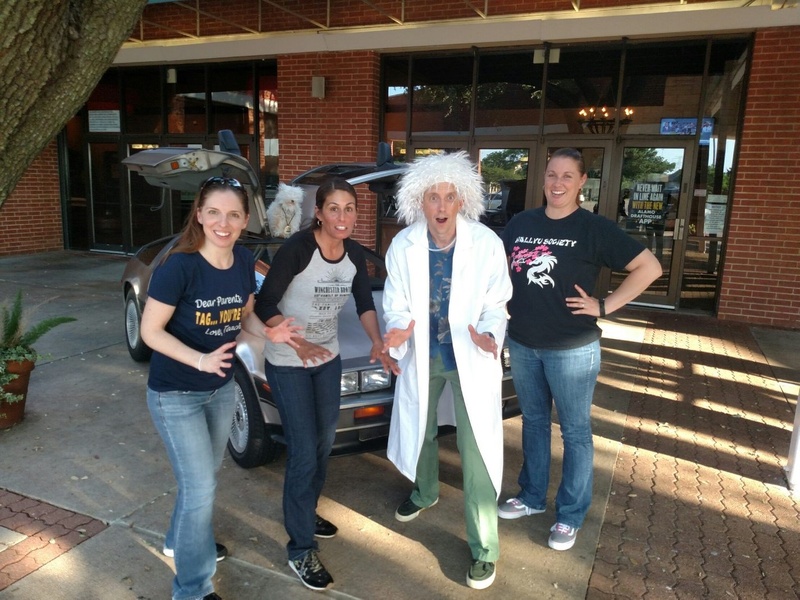 Hey, where's Einsteine? 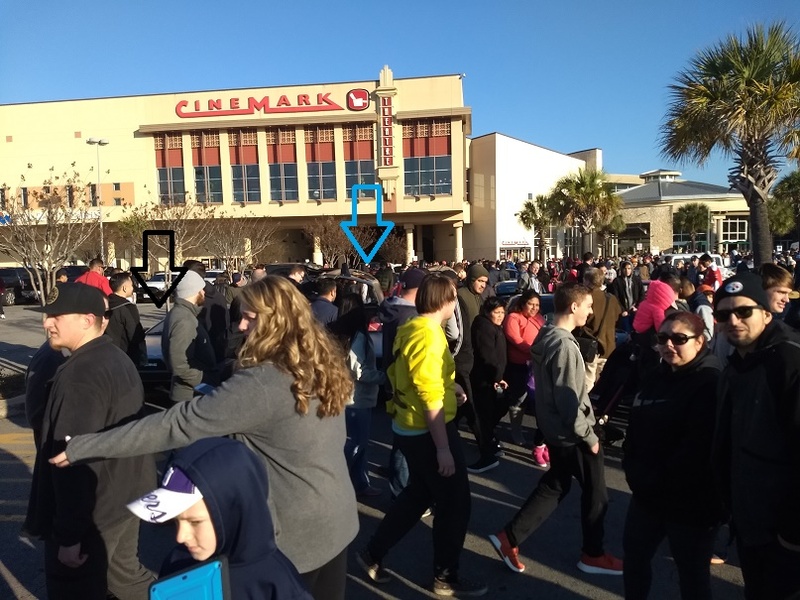 He's there somewhere. Oh wait, there he is, hard to see between the raised doors. Sunday, December 2nd, the Texas Volunteer Fire Fighters Relief Fund (TVFFRF) Parade of Lights was held in northwest Houston (Cypress Fairbanks ares). 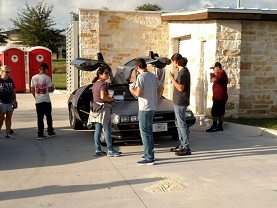 Three Texas DeLorean Club cars attended; Shannon, Susi and Einstein Birdwell, Kimberly and Jeff Terrell, and Chris Slay. Thanks to everyone who attended. Photos by Shannon Birdwell (click images to enlarge). Kimberly and Jeff, clearly excited about being here. Shannon and Susi, clearly excited about being here, redux. 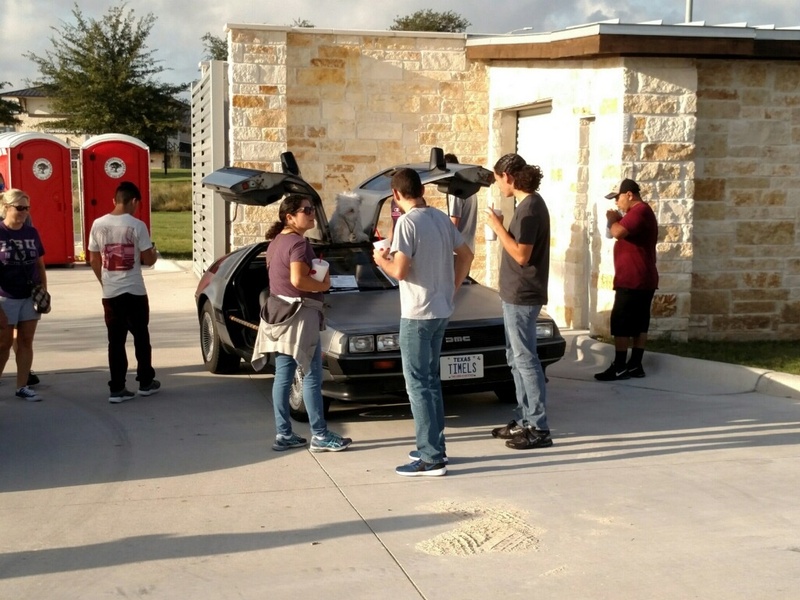 The three cars, and Einstein. 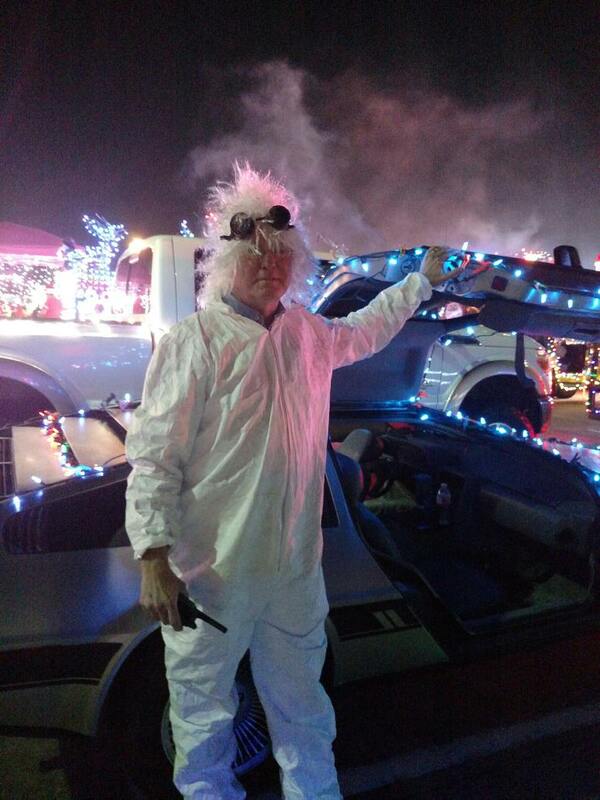 Doc Brown, getting ready for the making of BTTF-IV. This page has been viewed 1766 times.